Tas: In a recent game (i played white) my opponent aproched my 44-stone two times like this before invading at the 33-point. How should i have continued? Can the 33-stone be killed? Gronk: Below, tderz gives some example continuations and suggestions. I think some more general points are worth making. If and were not present then, in the local context, leads to ko. However, surrounding stones matter and if White has the right kind of support, can be killed. On the other hand, if Black has the right kind of support, can live unconditionally. Details omitted because the possibilities are too great. In some sense Black owes moves at the points. So white can take either of these himself and push Black around a bit on the outside, either creating the conditions to kill or getting some outside influence while lives. How this goes depends on how Black responds. 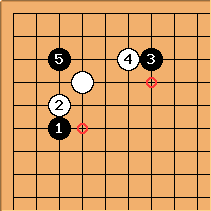 Which point to play depends on the whole board position. Tas: I did get outside influence while black lived small in the corner, and had som side territory. Were I playing White and facing such a player as Black I would first try to stay calm. Black is clearly aiming to start complications, hoping to trick White. By not over-reaching and keeping an eye on the whole board, White should do just fine here. I would suspect Black will continue to play this way (I've seen this type of player) and a calm approach usually overcomes it slowly but surely. Finally, note that Black could have omitted and and invaded straight away at the 3-3. 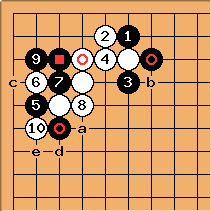 Had he done so, the standard joseki is sente for Black. So if White can come away with sente here then that is itself a gain. tderz: Without going into details here, there will always be a trade-off between "inner territory" vs. "outside influence". Black neglected twice to do the reinforcing tachis a and b. Simply by playing them himself; White gives Black again the chance to do something about that. 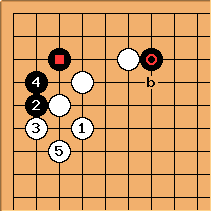 White is better off with this premature invasion than with a normal 3-3 invasion without these approach moves, because Black played out the all aji in that area. tderz: was a little strange, white could have gripped with or play at b.
I would not worry so much about a low black c as white takes a wide d or so. 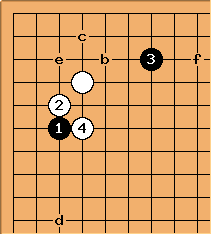 The -c extension is low and White can still play e or check with f.
White has safer positions than Black. tderz: e.g. 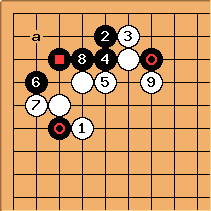 this would be consequent bad black play, consistent with black's previous style. tderz: White is very strong on the outside. Strategically, both are dead and completely useless now. is necessary due to white's threat to kill a. The normal trade-off with and cannot be bad for White.